Ok, well where do i start? After reading some reviews before i left we didn't seem too worried as pre 2009 were mediocre and nothing really that major to worry about but post 2009 seem to be fairly positive due to the renovation of the hotel a year before. What i am just about to write is the truth, we arrived at the hotel and were pleasantly surprised by the junior suite we had booked it was spacious and modern, infact it looked just like a room that was in an Ikea showroom, we had a massive bathroom with a huge walk in shower with modern design. The Kitchen area was an adequate size and beds were comfortable so that was fine for us as we are only there to sleep, the staff were friendly and polite and would see to anything you asked of them straight away. 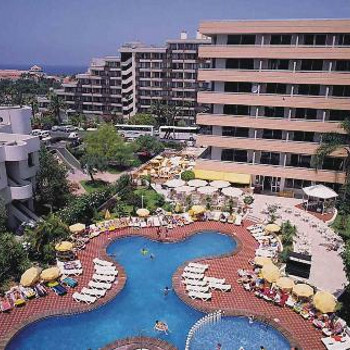 In 2009 the hotel was made an over 18s hotel only which is why we were attracted to the hotel in the first place so plenty of peace and quiet especially around the pool area which was cleaned and tested everyday. The pool area itself was immaculate, in fact its probably the cleanest pool i have ever swam in and the spa beside it was fantastic. Now here comes the negative bit! If you ever stay at this hotel i strongly advise not to go half board as we regretted it. The food was lousy, the breakfast was average at best but the lunch and evening menus were diabolical although the food was hot you had two choices with chips, chips and more chips with a dried up salad bar by 3rd day of our holiday we ate out as there are plenty of places to eat and in Americas you will never go hungry so don't worry if you are a first timer at this hotel or resort. All in all we had a fab holiday here and are already planning to go back and yeah we will be going back to this hotel cos we loved it, just a shame the food was not up to the standard of there cleanliness but we will definitely not be going even bed and breakfast but simple self catering. Ok, well where do i start? After reading some reviews before i left we didn't seem too worried as pre 2009 was mediocre and nothing really that major to worry about but post 2009 seem to be fairly positive due to the renovation of the hotel a year before. What i am just about to write is the truth, we arrived at the hotel and were pleasantly surprised by the junior suite we had booked it was spacious and modern, in fact it looked just like a room that was in an Ikea showroom. We had a massive bathroom with a huge walk in shower with modern design. The Kitchen area was an adequate size and beds were comfortable so that was fine for us as we are only there to sleep. The staff were friendly and polite and would see to anything you asked of them straight away. In 2009 the hotel was made an over 18s hotel only which is why we were attracted to the hotel in the first place so plenty of peace and quiet especially around the pool area which was cleaned and tested everyday, the pool area itself was immaculate, in fact its probably the cleanest pool i have ever swam in and the spa beside it was fantastic. Now here comes the negative bit! If you ever stay at this hotel i strongly advise not to go half board as we regretted it, the food was lousy the breakfast was average at best but the lunch and evening menus were diabolical although the food was hot you had two choices with chips, chips and more chips with a dried up salad bar by 3rd day of our holiday we ate out as there are plenty of places to eat and in Americas you will never go hungry so don't worry if you are a first timer at this hotel or resort. The food faled to meet the hot food standard and what was prepared was either over or under cooked, we also booked for a barbeque night, where the food was prepared earlier in the day, the pork chops were cooked dry, and the chicken was slightly undercooked. The rooms were spacious, but the beds were too hard for my liking. The patio door had no security and the noise from other guests moving their furiture above us was very intrusive. This hotel was clean and the rooms were seen to at regular times, the staff to be fair were always courteous and helpful. The clealiness was really good the hotel was relali good packed with both young people and families aswel as people of different cultures! Staff in the hotel were very cooperative! as we decided we wantd a pool view room and asked the very next day we got what we wanted! they were always smiling and keep the key for you! thats good if you love to party! Enjoyed the location of this hotel as quiet but near enough to the beach shops and night-time entertainment. The pool was very dissapointing as it only was suitable for small children and people who are confident swimmers as you could not reach the bottom of the pool in the other sections. Did not actually eat any meals here as it did not appeal to us just by what we did have from the poolside bar (tasted awful). Rooms very basic which is fine but big enough for what you need.Maid service is good and actually gets cleaned more than is stated in brochure. Staff tend to acknowledge the English people last and very laid back.In the 2 weeks we were there we only seen the scuba diving demonstration 1 fashion show no other entertainment was on even though stated that there would be. But overall we still had a good holiday. Half-Board food selection limited, sometimes not hot. Hotel Staff were friendly, the room was basic but clean. Plenty Sun-Beds But needed to get there early for one though. bit too far from the beach and didn't really stay in for the entertainment so can't comment. But we still had a good holiday though! We stayed at this hotel ten years ago and decided to go back again as we liked it the first time. The hotel is lovely and the apartments are the best we have stayed in, they are very spacious and well equipped. One disappointment was that the hotel is starting to cater for the 18-30 group the hotel has rules around the pool about the playing of radios so now the reps turn their own music up so you don't get any peace and they have a rule that no lilos in the pool but some days you could not swim because there was so many in the pool and this was adults, you can see this is accident waiting to happen. We would still recommend this hotel for staff friendliness and location, but would suggest it is more for under thirties age group. I stayed at the Coral Beach Aparthotel on a self catering basis. I found the hotel to be very clean and tidy and the staff extremely friendly and helpful. The location of the hotel was excellent, situated extremely close to all amenities. No taxis required. The entertainment programme was spot on for both adults and children and the entertainer was a top bloke. I would definitely visit the Coral Beach again. We were moved to these apartments 2 days into our holiday as our original apartments were not suitable. the apartments are spacious and very clean, the staff are helpful, there is entertainment day and night for adults and children. Max the entertainment staff was great, very lively and energetic. pool very deep all over but there is a separate childrens pool. the only down side is the hotel is for families and young groups, and it can get a bit noisy sometimes when the young groups come in, in the early hours of the morning.